Rachel Marco-Havens speaks in class and leads a workshop. Rachel-Marco Havens, activist, performer, and storyteller, and developer, spends Feb. 7 and 8 at Denison to work with students, faculty, and local activists to help us learn how to engage in activism. As a speaker in Dr. Toni King’s Black Women and Organizational Leadership class, Marco-Havens created a dynamic learning environment. She told stories of her activist involvements, shared her leadership values and philosophies, and discussed the life circumstances and events that shaped her race, class, and gender identities. 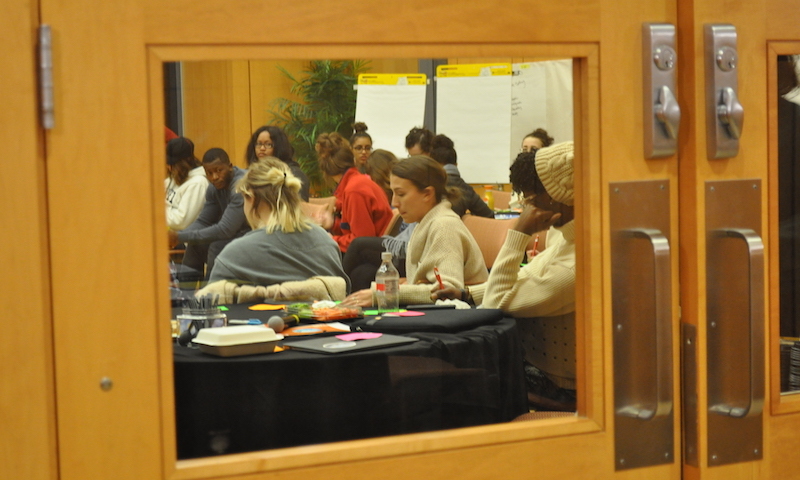 Later that evening, students from the Black Women’s Leadership course had the opportunity to witness and participate as Rachel Marco Havens’ activist leadership played out to over 50 students across the campus who attended the activism workshop sponsored by the Laura C. Harris Symposium: Leaderful Efforts, a part of the Laura C. Harris 2017-18 series: Leaderful Feminist Futures. This workshop was held in Knobel Hall during the evening of February 7th where Marco Havens joined local activists Carol Apacki (Licking County Concerned Citizens for Health and Environment), Rita Kipp (League of Women Voters), and Ceciel Shaw (Strong Voices Rising) to lead a range of activities spanning how to connect with members of the Denison campus and the surrounding community, how to build critical consciousness, how to cultivate individual intentionality and collective trust, and ultimately how to come together to establish shared agendas for change. The workshop included conversations regarding issues that members are passionate about, answering the question, “What is activism?” and planning out steps and techniques that can lead us to organize in small groups around common interests. Visual representations, conversations and dialogue enriched participants’ learning experiences during this workshop. 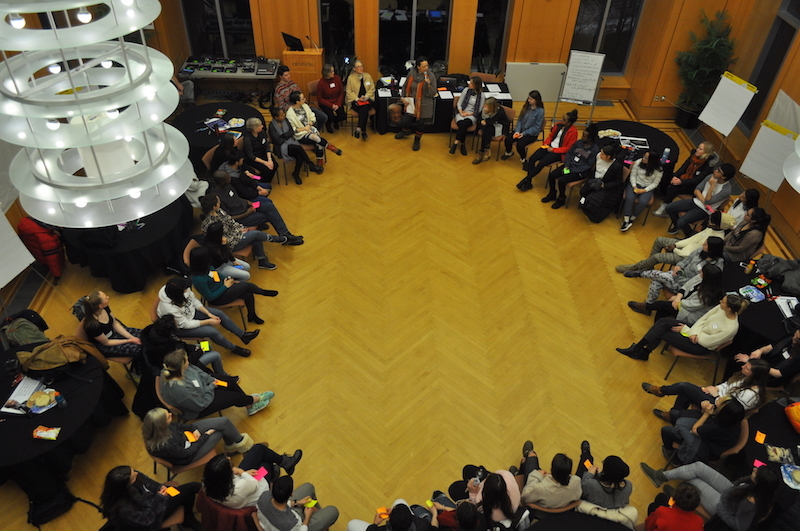 Within the space of three hours, diverse constituencies of the Denison campus connected, learned, and began to shape their own agendas for activism on a local, state and national scale. On February 8th, Marco Havens then participated in the “Courageous Voices Roundtable” which was a panel held at the Robbins Hunter Museum in Granville, Ohio. 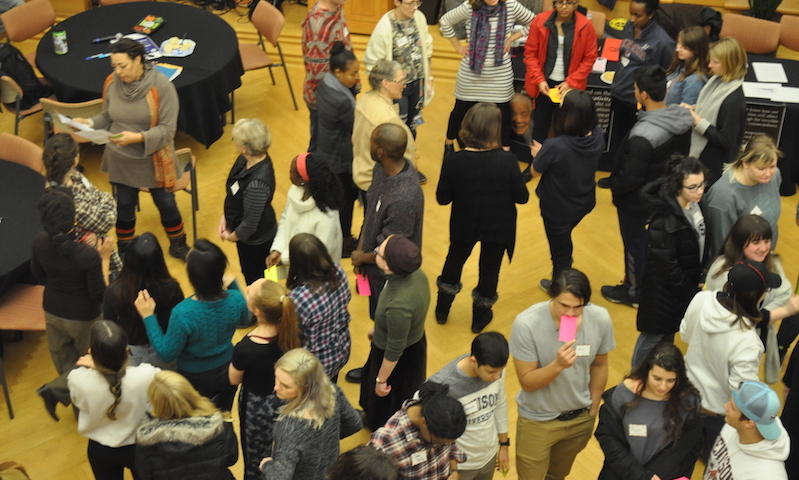 Shown below is an image of students during the Feb. 7 workshop on Denison’s campus. Jackson & King collaborate in "The Critical Black Studies Reader"
Attorney Aaron Webb '96 is COO of Morning Pointe healthcare services company. Webb majored in black studies and political science at Denison. Lewis argues that these protest movements demonstrate the potential of student civic engagement at Denison and beyond. Film promotes institutional reform, addresses the inequities of a warped sentencing system, and seeks to find justice for Jason Goudlock.